Guang Lin, a computational mathematics researcher in the Fundamental & Computational Sciences Directorate at Pacific Northwest National Laboratory, has been invited to serve on the editorial board for the prestigious International Journal for Uncertainty Quantification. The publication features information in the areas of analysis, modeling, design, and control of complex systems in the presence of uncertainty across all areas of physical and biological sciences. Lin will lead the team that reviews submissions and makes recommendations on which manuscripts to accept for publication. The 11-member editorial board includes representatives from other national laboratories, as well as universities and industry. 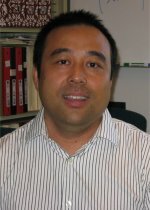 Lin is a member of PNNL's Computational Mathematics group. His research focuses on high-order numerical methods for stochastic partial differential equa­tions, uncertainty quantification, computational fluid dynamics, petas­cale data analysis and dimensional reduction techniques, extreme-scale computing, and multiscale modeling. Lin has been highly involved in investigating high-order numerical methods for stochastic partial equa­tions, uncertainty quantification and petascale data analysis. He is the principal investigator on a project funded by the Department of Energy's Office of Advanced Scientific Computing Research (ASCR) that focuses on extracting and reducing data from massive volumes of information to quantify and reduce the uncertainty in the climate models. He also is strongly involved in studying multiscale modeling and has been a key investigator of the Northwest Consortium for Multiscale Mathematics project. Lin is also active in the eXtreme Scale Computing Initiative at PNNL, in which he is a co-PI of a extreme-scale computing project focusing on restructuring STOMP, a multiphysics subsurface code, so that it can scale to extreme-scale comput­ing nodes. Lin holds a Ph.D. from the Division of Applied Mathematics, Brown University.